Ok well it’s taken a year but it’s finally here. After thinking about having a blog for a year I have now seen all the online tutorials and waded through zillions of other people’s blogs to get to this stage. So I’m a little behind the pack but better late than never. I am the voice behind the shop Apatchy Quilting but don’t stress this blog won’t be all sell sell. I would like it to include a gallery of my work, my clever customers’ work, humour, tutorials, patterns and links. As well as all that I would like it to be a conversation between the two us where we can exchange ideas – on lots of aspects of our craft. An ambitious goal I hear you say but what about what I want? Good point….. Why don’t you tell me then? 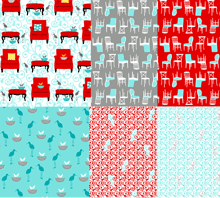 So the first 20 people to send me their (constructive) comments on what they would like to see in this blog will go in the prize draw to win three fat quarters from the ‘Perfectly Perched’ fabric range. So now I’m perfectly perched waiting for your response. Congratulations Kaye I am sure this will be a valued asset. I would like to see some exchange of tips and techniques, new creative ideas. swap thoughts and seek help. Of course up to date stock and the latest gadgets too. Good on you for taking the plunge, Its always great to see little easy , quick projects, Thats what I like looking for in a blog and maybe ready made kits for these projects. Have fun blogging, I must say, I used to blog a lot until Facebook took over ! Congratulations Kaye on a big step forward. Mmm, what would I like see featured here! Updates on all your newest acquisitions of course. Reminders of upcoming events for those forgetful ladies who do not always attend weekly would be wonderful. Tips, hints, ideas, definatelyt new projects, all the things that make participating in a blog such a joy of communication. So you didn’t think you were busy enough, now you have a blog to maintain. Good for you. Since we met because I was looking for a specific fabric I think maybe your blog could help others find that very special fabric piece that might only be found in a fellow quilter’s stash. Well done,Kaye. I’m a coward and am not even going to try blogging. Like Sandra I’d like to see tips and techniques and new creative ideas especially for small gifts. A help section would also be a good resource i.e. making the most of off cuts of fabric and/or batting – maybe a link to colour selection guide/tutorial. It is always good to see various interpretations of the same design. Congratulations. It took a while for a dinosaur like me to even think about looking at blogs which used to be things that came out of swamps and marshes in midnight movies! I would like to see solutions to problems encountered with commercial patterns. I have only been at this stitching game for four years and almost every pattern I have attempted to use has several steps omitted. Contacting the publishers has seen no help forthcoming, so I have used some very unorthodox methods to solve some problems. Good luck, Kaye. I think you should come out of the stone ages and get Facebook…..then we can all be friends!!! Congrats mum on your new blog! Hello everyone. Happy New Year Kaye. New Year and a new blog. I love reading others ideas and what they have been doing/completing. lol. I am looking forward to classes from next week. I would also like to see hints and tips. I will start with one. I love Steam a Seam for bag making. works a treat to keep edges together for sewing and no pins needed. Well Kaye, you have come along way girl! We go back a few years before your ownership of Apatchy Quilting and it has been an inspiration to watch the progress and development you have strived for, especially gaining recognition as a successful businesswoman by winning the Quest Newspaper Award 2012. You lead the Apatchy ‘Squaws’ with great humour, generosity, compassion and patience and it is very much appreciated. Good luck with this additional string to your bow.